Identified Flying Object; not flying, obviously. The IFO at night; note the swing. Once a month it'll be hauled into the sky by a crane. 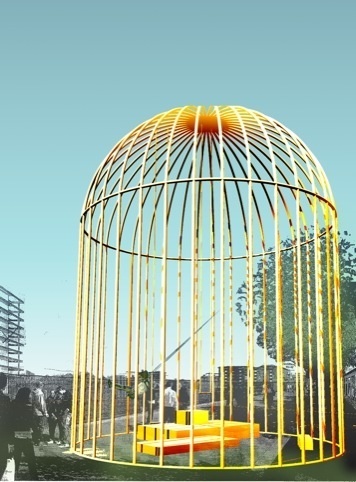 First came the art students, now comes the art: specifically, this installation, which will be arriving in newly-redeveloped landsnorth of King's Cross station from the middle of this month. 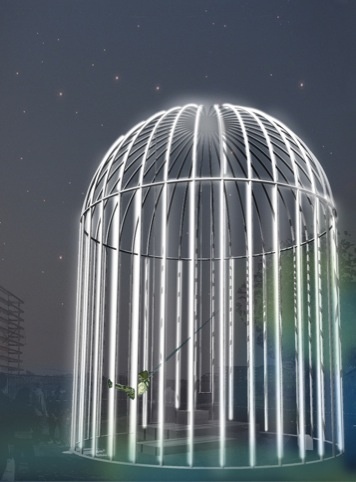 Called "Identified Flying Object", or IFO, French artist Jacques Rival's Brobdingnagian birdcage will rest on the ground for most of the time, where visitors will be able to slip through the bars and play on a swing. Once a month, it will be lifted by a crane into the night sky, where it should illuminate the local area and further confuse London's long-suffering avian population. Jacques Rival’s response to King’s Cross is both poetic and pertinent... This nomadic sculpture follows the flux and flow of this new district which is evolving day by day. Those are the words of Michael Pinsky and Stéphanie Delcroix, an Anglo-French curating twosome who are putting together Relay, an arts festival at King's Cross of which the IFO is the first part. 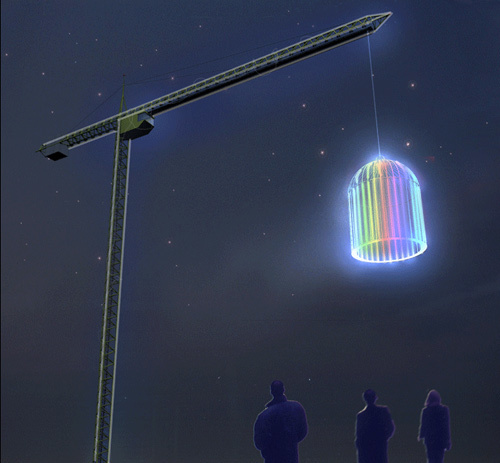 The installation runs from November 16th until mid-2013.